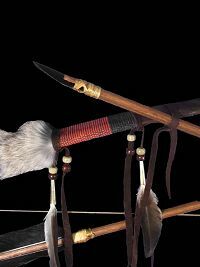 This bow and arrow set includes a beaded and leather wrapped bow with six fur accents (shown with rabbit fur), and comes with two crossed arrows. Crossed arrows represent friendship.The bow is approximately four feet long and is for decorational use, only. 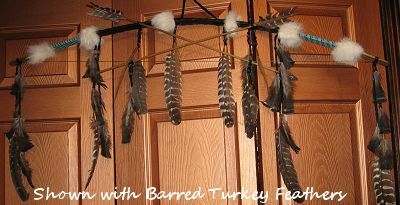 The bow is decorated with glass seed beadwork,your choice of black or gold authentic buckskin , buckskin fringes and your choice of feathers (pictured with goose feathers in clickable thumbnail, barred turkey below) and bead colors of your choice. You can order this bow decorated with up to two colors of the crow beads pictured in our craft section. Choose your preferences from the dropdown boxes below. The pictures shown are representative. 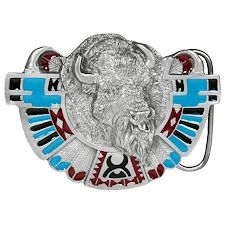 Because this is a one-of-a-kind hand crafted item, the one you receive may vary slightly from the ones pictured. Allthough crafts are usually completed in less time, allow up to two weeks for completion of this item, plus shipping time.